Female bodybuilding physiques are lean, muscular and sculpted. The world of female bodybuilding can be daunting to enter. While the initial images you conjure up may be of bulky, masculine-looking women with ripped muscles, this isn't always the case. In the 1990s, figure and bikini classes were introduced into women's bodybuilding for those who wanted a smaller yet defined and aesthetically-pleasing physique, says trainer Matt Weik of Bodybuilding.com. Before you take the plunge into competing, there are several important factors you should consider. Perform three weight-training sessions per week, hitting your whole body each time. Base your routine on compound exercises such as squats, lunges and deadlifts. 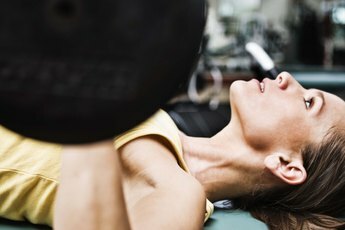 These burn the most calories, hit more muscles and give the best bang for your buck, claims Rachel Cosgrove, strength coach and co-founder of Results Fitness in California. If you're not sure of any exercise techniques, ask a trainer at your gym for assistance. Multiply your body-weight in pounds by 10 to get the minimum number of calories you need each day, advises champion female bodybuilder Jamie Eason. You then need to add 300 to this if you have a sedentary lifestyle, 500 if you're moderately active or 800 if you're highly active. Aim to get your calories from nutrient-dense foods such as lean meat and fish, low-fat dairy products, beans, fruits, vegetables, whole-grains, nuts and seeds. You may need to play around with your calorie intake slightly until you find the perfect balance. Set small attainable goals. If you've never lifted weights before, trained at very high intensities or followed a strict diet plan, then going from where you are now to a female bodybuilder is a long road. It will be tough, but see that as a challenge rather than a disadvantage. Set both outcome-based goals such as adding half a pound of muscle a week or competing in a local show in six months. Aim for behavioral goals such as making it to the gym five times per week or sticking to your diet for an entire fortnight. Visit a few bodybuilding shows and speak with competitors and trainers to see if this is something you really want to pursue. Consult your health care provider before making any drastic changes to your diet and workout schedule. Bodybuilding.com: Which Body Do You Want? The Figure Nicole's Or The Bikini Nicole's?